Hey guys! Happy New Year, woo!! Just wanted to share with you guys these awesome products that I used to help me get ready; I wouldn't have been New Year's ready without them! My first product is a Tarte foundation that I actually just purchased the other day, since my old BB Cream foundation just wasn't cutting it any longer. Let me tell you this foundation is AWESOME! It doesn't feel too heavy on the face, and it didn't make me feel even the slightest bit oily. I applied it with my Maybelline Beauty Blender, and it went on very smooth and even. If you're looking for a new foundation, I recommend this combo. My next product is my new Becca Highlighter that I got for Christmas. After I set my foundation and contour with powder, I used this highlighter on my cheekbones, brow bone, and on the bridge of my nose. It caused the light to hit all the right spots! Definitely check it out. My next product is an eye shadow that I found in Walmart from Wet N' Wild. The sparkles were perfect for the occasion- it went on easily and held up pretty well throughout the night, which is exactly what you need from an eye shadow. 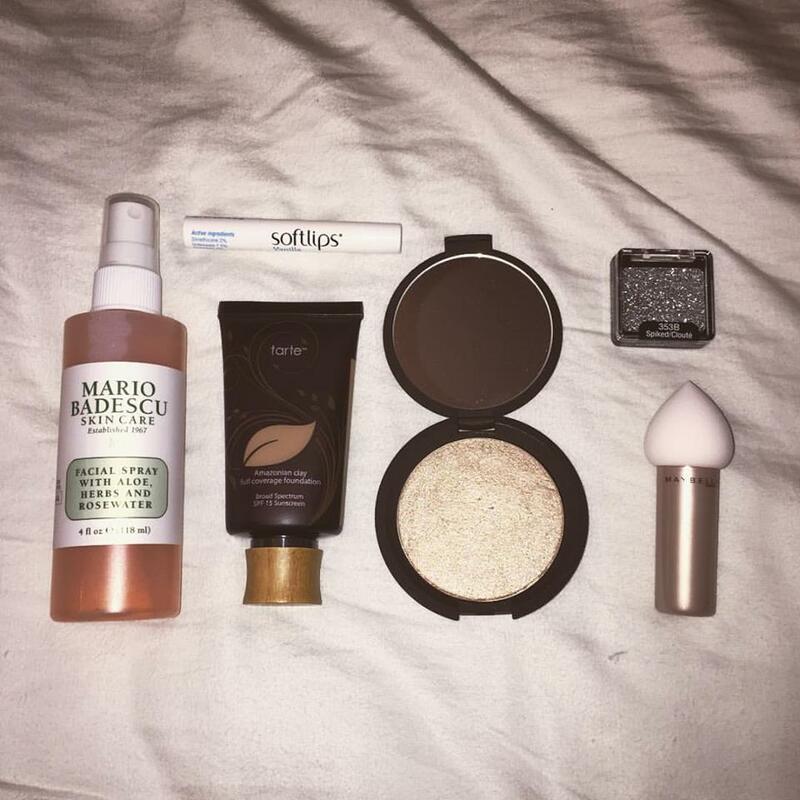 My last two products were a Mario Badescu Rosewater facial spray, as well as a Softlips lip balm. These two were great finishing tools- the facial spray left my skin looking hydrated and dewy, and the softlips was perfect in keeping my lips hydrated. I highly recommend both! Thanks for checking up on me, and I hope you get everything you want out of this New Year. Remember- the time is now! Seize the day, and don't let another year go by without reaching your goals.